Joint Army Navy Coastal Artillery in early World War II. The Naval Act of 1916, even before the US entry into World War I, called for a massive expansion of the US Navy. Among other things, it authorized a class of fast battlecruisers, of 33 knots, armed with eight 16” rifles. Already about a quarter complete, the prospective battlecruisers Lexington and Saratoga were instead completed as fleet aircraft carriers. Their 16” turrets and barbettes were removed, and a flight deck built instead. But early in the development of carriers, since night and foul weather air operations were virtually impossible, it was thought that carriers needed strong self defense against enemy surface ships. Accordingly, Lexington and Saratoga received an armament of four twin 8” gunhouses, roughly similar to that of a contemporary heavy cruiser. The gunhouses were arrayed for an aft of the massive island along the starboard deck edge. Experience in the interwar years, and the early months of World War II showed that the carriers would virtually always be escorted by heavy cruisers anyway, and that the primary threat to carriers would be aircraft. Further, the massive muzzle blast of the 8” guns mean they could not really be trained to port without damaging the flight deck, and of course, any aircraft on it. And so, the Navy decided that at the earliest opportunity, the 8” gunhouses would be replaced by a similar number of twin 5”/38 dual purpose guns. Both Lexington and Saratoga had their 8” guns removed in the early months of 1942 at Pearl Harbor. One of the things that surprised both the Army and the Navy after the devastating raid on Pearl Harbor on December 7, 1941, was that the Japanese didn’t follow up the raid with a bombardment of shore based installations by a battleship or cruiser force. The coast defense of Hawaii was decent, but by no means impregnable. And the possibility that that Japanese might return to strike again was not to be dismissed. So early 1942 saw Hawaii with eight 8” gunhouses. The Army typically developed its own series of coast defense guns. But they weren’t about to look a gift horse in the mouth. There are three militarily significant harbors on Oahu- Honolulu, Pearl Harbor, and Kanehoe Bay. Each was already defended to some extent by Endicott/Taft period fortifications, and plans were in hand to install newer Army designed batteries. But the availability of surplus 8” guns meant the Army could rather quickly install even more batteries. Each harbor would receive some of the surplus gunhouses. 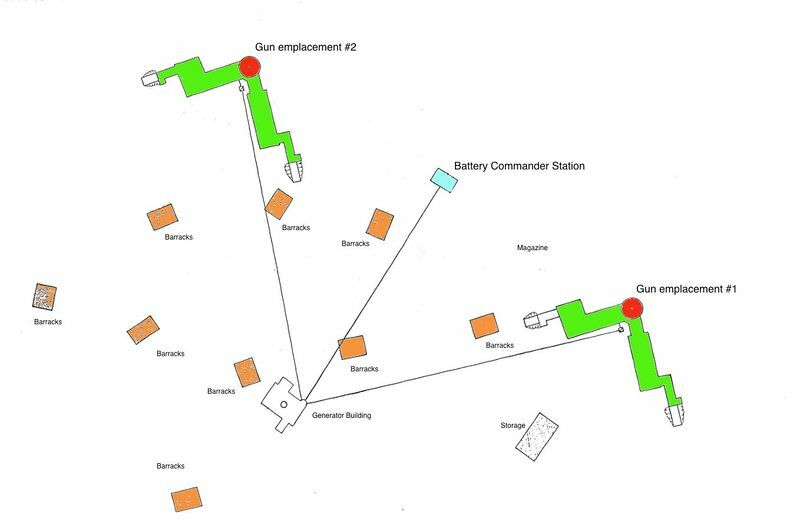 A typical battery was two twin gunhouses, each mounted atop a concrete tunnel that linked in a “Y” shape to its own shot and powder rooms, with a power generator, and a battery control post in the middle. A fire control radar was also supplied, usually disguised as a water tower. Construction of the batteries took about a year, by which time, the threat was mostly past. Of course, bureaucratic inertia meant that the batteries were manned and on alert almost to the end of the war. And these weren’t the only surplus naval guns used in Hawaii coast defense. 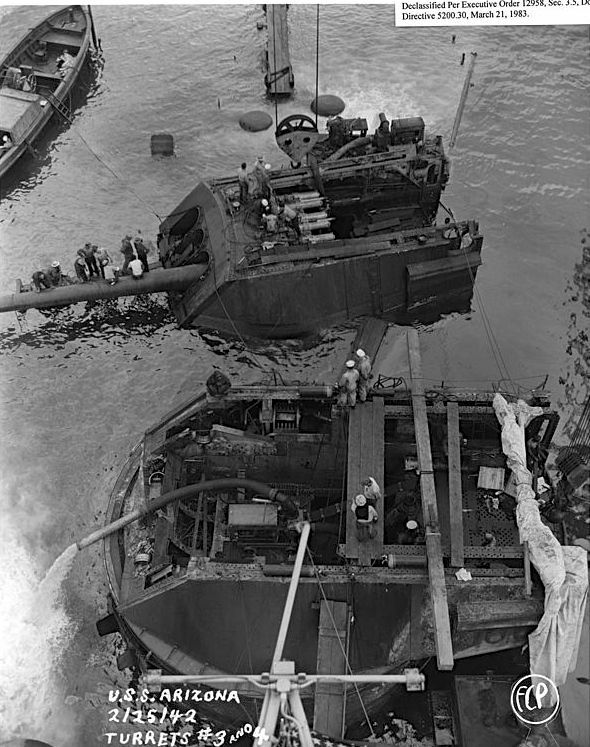 When the USS Arizona was spectacularly destroyed during the raid on Pearl Harbor, two of its turrets was completely destroyed. The other two, however, were almost completely intact. And since the ship itself could not be salvaged,** the turrets were slated to be similarly utilized as coast defense batteries in shore emplacements. Of course, moving a lightly armored twin 8” gunhouse is a lot easier than moving the several hundred tons of a fully armored triple 14” turret. Construction began in 1943 while salvage operations at Battleship Row were still underway. Eventually, Battery Arizona and Battery Pennsylvania each received one turret, and work was almost complete when the effort was suspended on the first of August, 1945, by which time the threat was obviously gone, and coast artillery was clearly obsolete. Images and information courtesy of the excellent Fort Wiki. *We often hear that it took Pearl Harbor for the carrier advocates to come to the forefront. But looking at the WNT a mere 3 years after the introduction of the first carrier tells us that naval strategists clearly saw that naval aviation would rise to the level of capitol ship very quickly. Author XBradTC2Posted on December 13, 2015 Categories coast artilleryTags coast artillery, guns, hawaii7 Comments on Joint Army Navy Coastal Artillery in early World War II.